What type of tank is needed to test a wave energy absorber? Standard tanks for testing ships are a good start, but wave energy has 'special needs'. Here is a check-list of specifications, including a wish-list of features that are nice to have. They are grouped under 7 headings: repeatability, depth, working area, get the waves you want, know the waves you get, get the data you need, don't let scale muck things up. Force feedback wave-makers: generate the same wave whatever the instantaneous water level, so are resistant to waves radiated or diffracted by the model. They also absorb waves, limiting reflections during tests and shortening settling time. If force feedback paddles are unavailable, then the regular waves at the start of each run (after transient response has settled) will be the best quality. Repeatable wave generation method: it must be possible to generate the same sequence of waves (not just the same spectrum) repeatedly. So a method that makes use of a different sequence of random numbers for each run will not be suitable. Repeatable positioning: Position of model and sensors must be repeatable. There should be a permanent and unambiguous method of recording sensor, gantry and mooring positions. Synchronisation: of the start of wave generation with data acquisition (as well as multiple data files with each other) is a useful feature and eases post-processing. The ratio of wavelength to water depth determines whether a regular wave is regarded as 'shallow', 'intermediate' or 'deep'. Shallow-water concepts: if the device operates in shallow water, shallow water waves are required at model scale. Typically piston wave makers are used. Adjustable depth is a useful feature: either a movable floor, or adjustable paddles along with water-depth. If water level is changed regularly, the option of discharging into a purpose-built reservoir can save water consumption. Anything else: there is a preference for deep water waves, even if operation may be in 'intermediate' waves. It is convenient to have all spectral components in the 'deep' regime. Typically flap wave makers are used. Blockage effects: wave absorption is significantly different in narrower tanks. There should be a clearance of at least five times the model's frontal width on each side; preferably more. Distance from wave maker: as with all tank tests, the working area should not be within the region of the wave-maker's evanescent wave (the disturbance caused by the wave maker's added mass). Orientation: as with all tank tests, there should be enough space to change model orientation if required. Central pit: If there is a deep central pit, the working area where there is a 'deep wave' profile will be smaller than the central pit, as there will be a transition region. It is useful to know where this transition region lies. Access: If the tank is too deep to wade about in waders, then a movable section of floor in the working area is a useful feature: with the floor up, testers can safely make changes to the model. The standard methods of access are a gantry or a dingy. Limit reflections: on the wall opposite the wave makers there should either be absorbing wave makers or beaches with good absorption characteristics. Limit side reflections: the problems are a) cross-waves that progressively build up between parallel walls, and b) waves arising from the model (radiated or diffracted) which reflect back towards the model. Ideally the tank should be much bigger than the model, but this is not always practical. An alternative option is some form of active (absorbing wavemakers) or passive (beaches) absorption on all tank walls. This may interfer with wave propagation, which would reduce the working area. Spectral shape: should be reasonably close to that demanded. Calibration may be required. Some wave energy converters have resonant behaviour, so it is of interest to have the right amount of energy at the frequencies of interest. Choice of spectrum: it is useful to be able to choose between a variety of standard spectral shapes, as well as double-peaked spectra, and spectra from recorded sea states. Choice of phase: it is useful to have access to multiple permutations of the same spectrum. If using a Fourier method, this is done by choosing different 'seeds' for generating the phase of each component. If using a 'white noise' method, different choices of 'seed' would give different sequences of random numbers used as inputs. Direction of waves: It is essential to be able to test how wave direction impacts performance. Either the model's orientation must be changed, or the wave direction must be adjustable. The latter requires wave paddles to be able to operate out of phase so that they generate a wave which travels at an angle to the line of wave makers. Banks of paddles on orthogonal walls will increase the range of angles possible. Short-crested waves: a wide range of wave directions also allows waves with directional spreading (short-crested waves) to be used. Short-crested waves are not typically used in early stages of development, but are vital to test devices prior to sea-trials, even for shallow water concepts where long-crested waves are more typical. Measure before: waves need to be measured in the absence of the model, in the position of the model. This should preferentially be done before model testing (at the same time as calibration), and if time permits, checked after the tests. The energy in the measured wave should be characterised. Limit deviations from measured waves: ensure the waves measured before the tests are the same as those experienced during the test by limiting reflections off walls and leaving sufficient settling time between runs. Ensure that wave probes are calibrated and that the waver level remains constant. Check during: as with all tank tests, it is useful to measure waves during tests (usually ahead of the model) to check that the right wave was selected and provide a retrospective safeguard. Knowledge of regular wave nodal points: knowing where these 'hot-spots' occur, and at which frequencies, is useful for informing the position of the model and wave probes. Motion capture is a common requirement. Up to 6 degrees of freedom for each body may be required. Some models contain several bodies or flexible materials. The most common methods involve video recordings of calibrated markers, which must remain above water. It is useful to have such measurements available real-time and to enable these to be synchronised to other recorded data. Sensors: should have high resolution. Tests should make good use of the sensor range to ensure good resolution and coverage. Hence the availability of sensors with different ranges is useful. If shock loads are being measured, sensors must have good time resolution, and a high sampling rate is required. Equipment/methods for calibrating sensors should ideally be readily available. Commonly used sensors include those for recording force/torque, water level, pressure, speed, and strain. Real time measurements: data must be visible during a run to ensure all sensors are operational and the set-up is correct. Motion measurements are useful for ensuring that the model has the intended equilibrium position at the start of each run. On-the-fly processing: to aid decisions in the testing program (e.g. choice of damper) it is benficial to have summary data on demand; if necessary, after each run. Stationary 'ground': as with all tank tests, structures intended to be stationary must be stationary. Movement in support structures could be caused by someone stepping on them, resonance, loose connectors, or insufficient stiffness. Support structures should be designed with resonant frequencies sufficiently far from the operational frequency range of the wave tank, bearing in mind that models may have non-linear harmonic responses. Motored oscillation: a less common requirement (mainly due to the prohibitive expense) is a support frame that can drive oscillation on demand in any of the body's 6 degrees of freedom. This can be used to measure radiation coefficients and observe wave radiation. Not the type of scale that is mucking up the inside of your kettle; model scale. #1 all round favourite muck up: bearing friction in a model or support structure. Froude scaling gives big scaling coefficients for model scale forces and powers. Small unintended friction (damping) in joints and sliders scale up to huge energy wasters at full scale. Fluid losses: another way to get unintended damping is fluid viscous losses. This applies to structures that are small compared to the wavelength: model components, support structure, or sensor equipment consisting of thin beams, perforated material or material with sharp edges. High resolution sensors: special attention should be paid to the resolution of sensors for parameters that have high scaling coefficients. Pressure/volume: the pressure/volume relationship does not stand up to Froude scaling. Mitigation may be required. It may not be pretty. This list is based on my experience of testing a very limited range of concepts, in a limited context. I expect that other concepts or contexts will result in some different points. I hope to add to this list as I gain more experience with experimental work. This list was compiled after speaking to only a few people regarding what they wanted to know about wave tanks. If there are any questions I've not answered, or points which are glaring in their omission, feel free to leave comments. 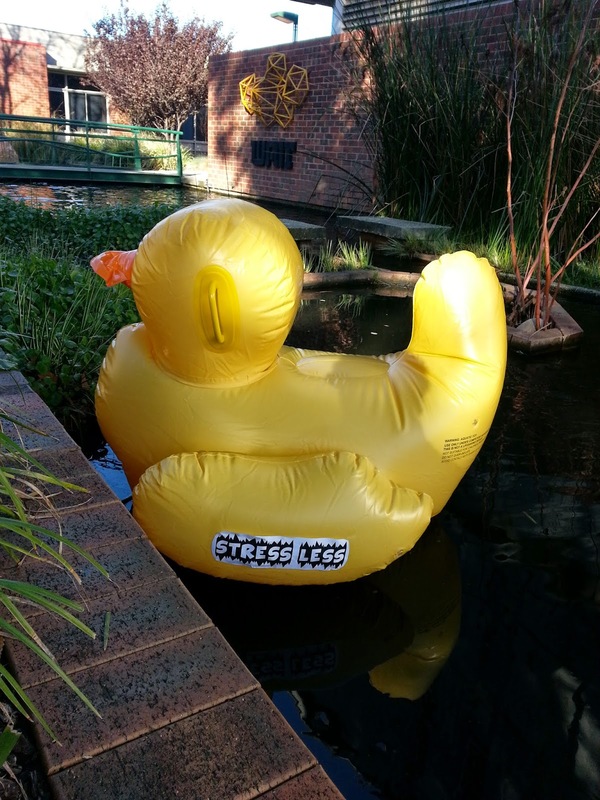 Stress-less duck, copyright and many thanks to Shawn Ryan, who spotted this at Curtin University, Australia.